Our locations in Texas are on standby to assist you! Equipment sales – attractive financing options for new equipment or assessment of your fleet. What do I do if I am affected by the hurricane and am not able to make my Hyster Capital or Yale Financial Services lease payment? 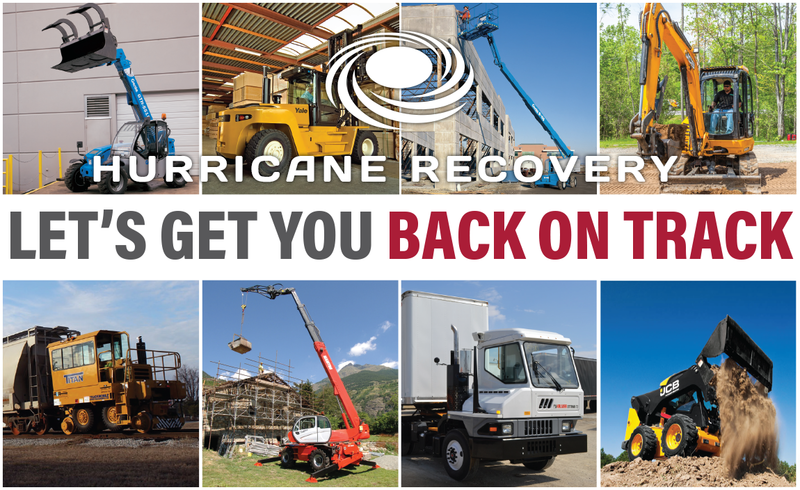 For customers currently financing equipment through Hyster Capital or Yale Financial Services, as soon as you are able, call our hurricane hotline at 1- 800-421-1656. Payment options are available to help you through this difficult period. Contracts may be renegotiated, extended or rent holidays may be available. For customers currently financing equipment through Hyster Capital or Yale Financial Services, please contact our insurance expert Christi Price at 406-831-4134. Christi will update our records to reflect the current status of the equipment and answer all of your insurance questions. My forklifts were damaged or destroyed in the hurricane, what should I do? For customers currently financing equipment through Hyster Capital or Yale Financial Services, call our hurricane hotline at 1-800-421-1656 and update us on the status of your operation and assets. Use the links above to request new equipment or short term rentals. Young and diverse fleet and preferred rates with flexible terms available daily, weekly, monthly or as long as you need it.